If you grew up in St. Louis and then moved away like I did, I’m sure there are many things you miss about home and undoubtedly many are food related. I can’t help you with Vess soda or pork steaks, but Imo’s Pizza, well that’s another story. Keep reading and soon you will be enjoying Imo’s just like you were back in the Gateway City. I realize that not everyone likes Imo’s Pizza, even some St. Louisans, but I do. Every time I go back home the first night back I have Imo’s for dinner. My order is always the same an extra large (16 inch) sausage and pepperoni pizza and a house salad with house dressing. Recently my Imo’s of choice has been the one on Manchester Road in Des Peres, but my first Imo’s memory was in the City at Gravois and Arsenal. When I was in college I missed Imo’s so bad my dad would freeze it and bring it to me when he came to visit. Now when I miss Imo’s I follow the following battle plan. Believe it or not Imo’s delivers everywhere in the United States including Alaska and Hawaii. They do not deliver internationally so this won’t work if you are spending the winter in Mexico. You also can’t use this method if you are in areas near an Imo’s, but for the rest of us you can just go on imospizza.com and place your order. Click on the link near the bottom that says “Shop our online store”. Here you will find pizzas, salad dressing, provel cheese, and even “deep fry ravioli 260 count”. I tried to figure out how long it would take me to go through 260 toasted ravioli. You can also get Imo’s gear if you want to wear a T-shirt that no one where you live will understand. Let me warn you. It’s not cheap. The pizza is reasonably priced but the shipping will set you back. My most recent order was six 12-inch sausage and pepperoni pizzas at $12.00 each and shipping charges of $54.58. This brought my grand total for six medium pizzas to $126.58 or $21.10 a pizza. When you get desperate, you do desperate things so I ordered. 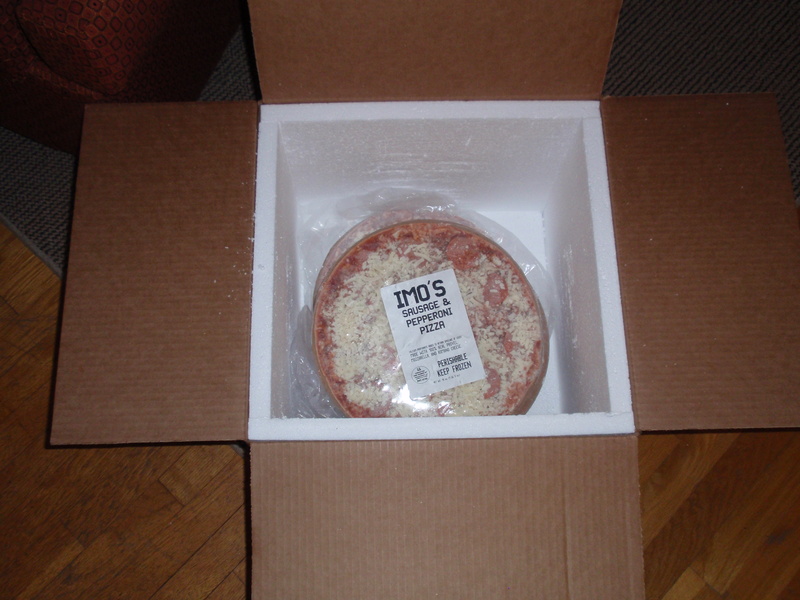 They ship your pizza in dry ice with two-day FedEx, but depending on when you order the processing and delivery can take about a week combined. So now you wait. About a week after you place your order a box will be waiting for you when you get home. Inside will be your pizza and maybe a little dry ice. Carefully unpack and put your pizza directly into the freezer. Imo’s gives you lots warnings about what to do if there is remaining dry ice; after reading them I had nightmares about dry ice. Anyway, you are now prepared to have Imo’s whenever you want. There are directions on the pizza that tell you how to cook it. If you follow them your pizza will be bad. Well maybe not bad, but I wasn’t impressed. It took me about four pizzas (read $84.40) to get this right, but now I can make a pizza almost identical to the ones I get at Imo’s. The instructions say to cook your pizza at 450 degrees, but this isn’t nearly hot enough. I tried it and I tried 500. Neither made the crust crispy and the cheese never cooked up the way it’s supposed to. It was always white, never that shade of yellow distinct to Imo’s and provel cheese. Once I turned the oven up to 550 I started to get the desired result. I also moved from the rack as called for to a pizza stone. If you don’t have a pizza stone, it’s okay you can cook it on the rack. 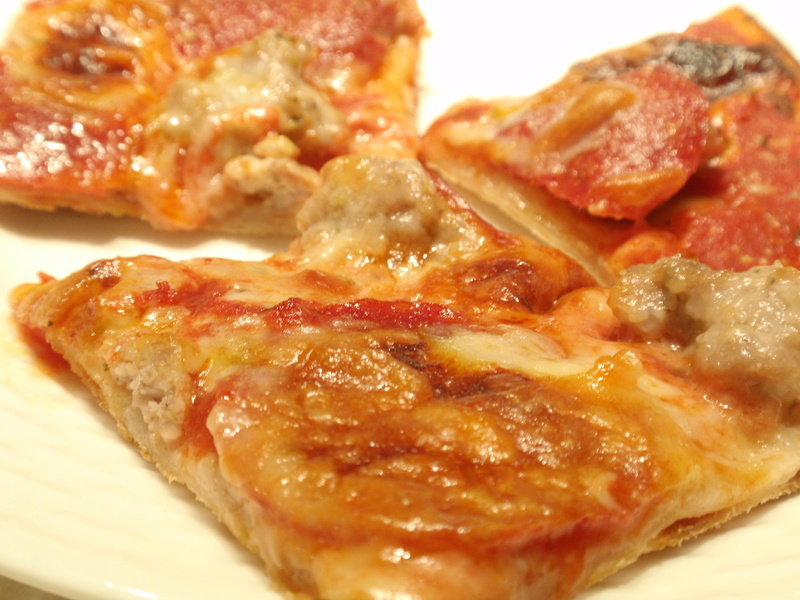 Your pizza just won’t be quite as crisp. If you do have a stone, make sure you let your oven heat up for an extra fifteen minutes or more to get it fully heated. Next you need to figure out the right amount of time for your pizza to cook. For me at 550 it’s nine minutes. Remember at this temperature things move fast. I would suggest the first time you cook one you start at seven minutes then watch for the moment when it is done. The pizza should be bubbling and the cheese golden with a little bit of char on the edges. Sorry. This is important. 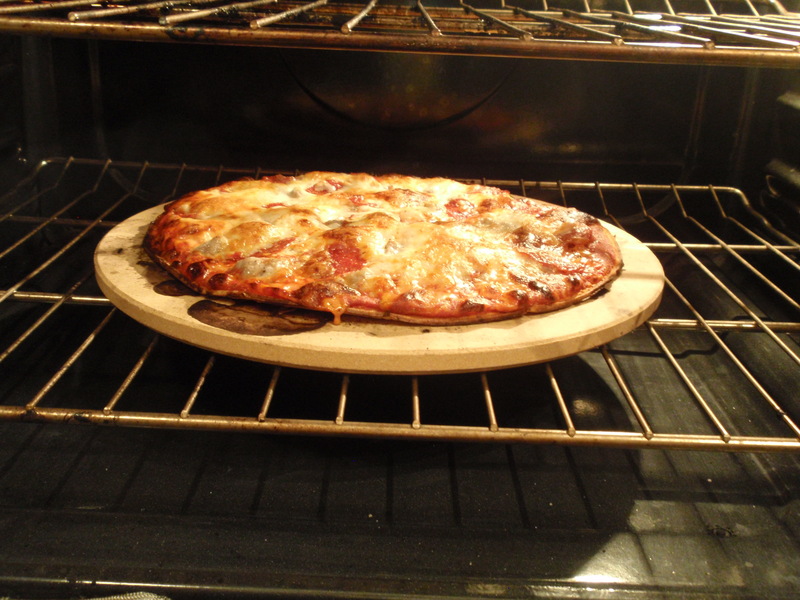 Remove the pizza from the oven and place it on a cutting board or cookie sheet and wait. You should wait about five minutes. I set a timer so I am not tempted to wait less. This allows the pizza to set up so that when you try to cut it the topping will stay in place. I tried to cut one right out the oven and the cheese and sausage piled up. This will also protect your mouth. I can’t tell you how many times I have killed my tongue on some Imo’s. Protect yourself and wait. This is easy but the first time I did it I screwed it up. I guess I have been foolishly cutting other pizzas into triangle for years and forgot how to cut a square slice. 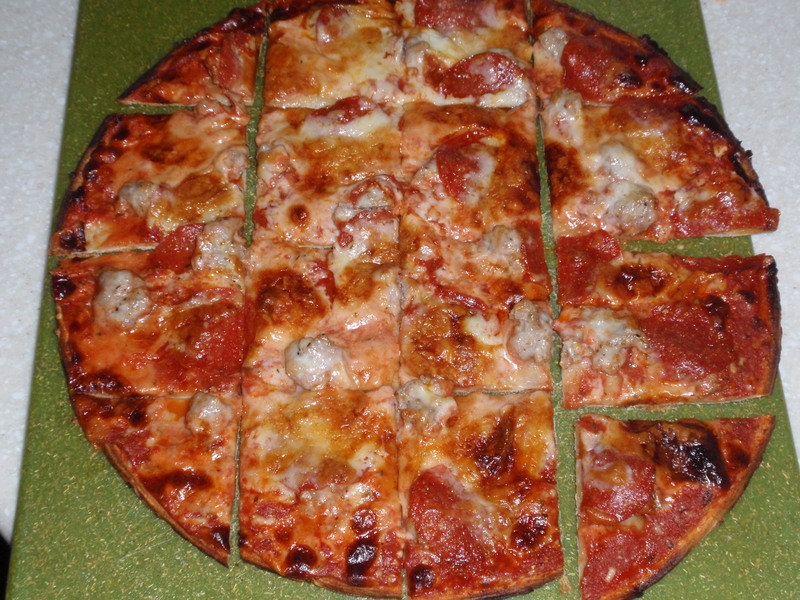 If you plan to cut your Imo’s into triangles, please stop reading now and go away. 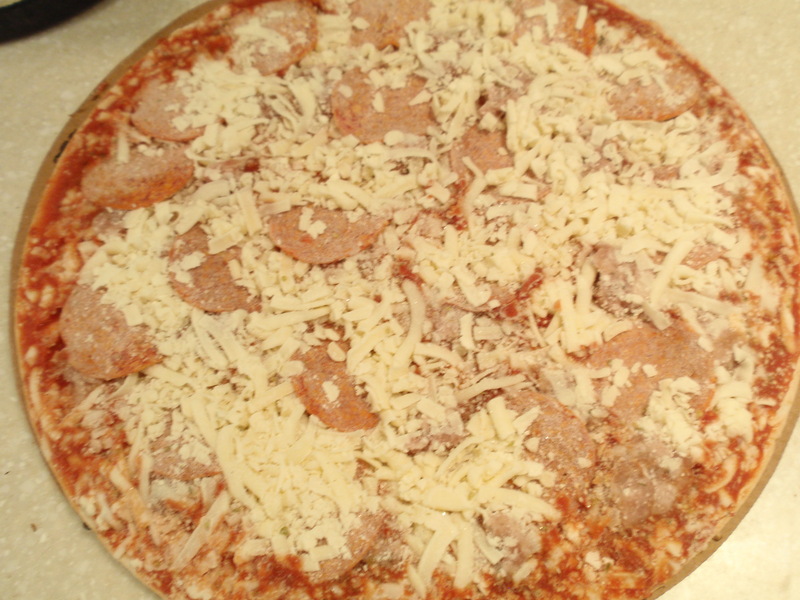 To get a perfect cut simply cut the pizza in half and then cut each half in half again. Then rotate the pizza 90 degrees and repeat. You will have sixteen pieces, four insides, eight outsides, and four corners, which are my favorite. You did it. You can now enjoy an Imo’s pizza far from home. I think you will find it hard to distinguish what you just made from what you get in St. Louis. Believe it or not the ones I make this way are better than many of the ones I get at home. So now all you need is a Vess Cream Soda or my favorite a glass of milk from Prairie Farms Dairy. Cheers! You are certainly a dedicated IMO pizza fan! It must be really great for you to go through all that effort. I think I will have to try it now!! I love it! Haha, wow, this made me smile just so, so much. As soon as I saw the word Imo’s I knew you were a St. Louis person. Now I have something shocking to admit: I grew up in St. Louis and I’ve never had Imo’s pizza. I know, it’s a poor reflection on me (and my parents). I’m ashamed! Thanks for stopping by my blog and liking my cheesecake post. Otherwise I’d never have seen your Imo’s post! It’s ok my brother doesn’t like Imo’s at all, so no matter what our parents do, there is no telling how we will turn out – lol. Thanks for the visit and if you visit St. Louis again, try Imo’s. You have to have it at least once! My brother lives in Des Peres so we get Imo’s almost every time we visit, love it. Looks like the long distance version worked pretty well. Dry ice is fun! Imos is yummy. I can remember as a kid, my dad would call to order Imos and ask if the delivery guy would stop and pick him up a gallon of milk and a pack of smokes on the way over, and they always did. haha Thanks for stopping by my blog! That’s fantastic. It’s amazing how times change. On a food note Imo’s and milk go really well together. Dang. Now I’ve gots the craving for those pizza’s. Dang now I feel like chomping one of those! OMG, I am so glad we chose to eat at Imo’s when I was there the spring of last year. It was so delicious, and I still crave it! Thanks for stopping by my blog! I’m from St. Louis, so I totally get not being able to get your favorite St. Louis foods when you’re out of town. I’m glad you found a way to always keep it in stock and enjoy it no matter where you go! I grew up in St. Louis, but probably before your time. My thoughts of St. Louis take me back to the “hill” for great Italian food. 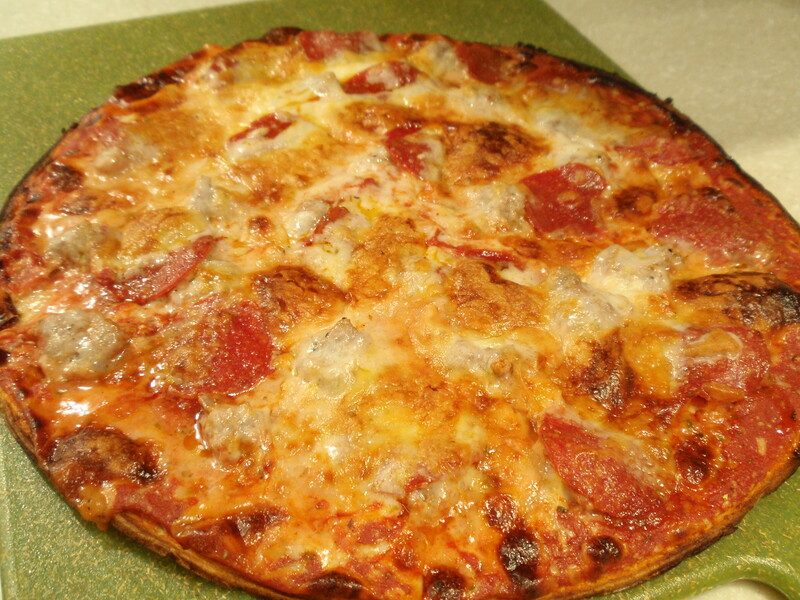 I’ve never heard of imo’s pizza, but your blog is hilarious. Do they really ship anywhere in the U.S? Thanks! The pizza looks amazing. Thanks, so much! 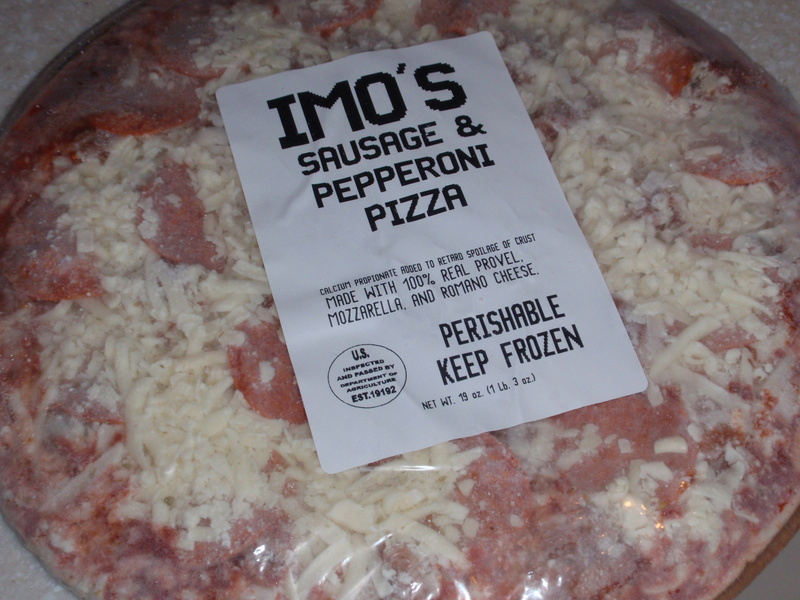 My boyfriend is from STL and LOVES Imo’s, but he’s always disappointed with the frozen ones. I just pulled one out of the freezer and decided to Google how to cook them to see if any other STL’ers had any advice before following the included instructions, and I’m so glad I did! I’m so glad that you found it. 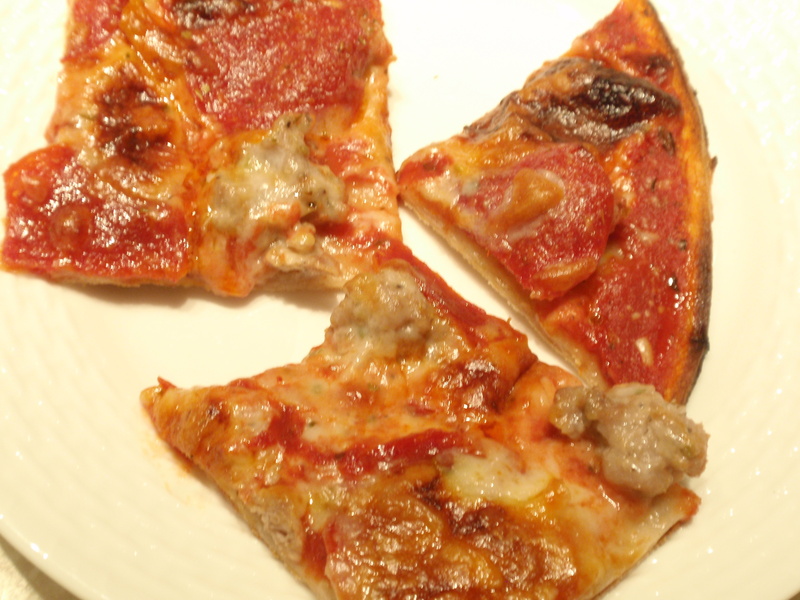 Imo’s pizza is one of my favorite things ever and it is so great to be able to make it at home and have it taste. Thanks for the cooking tips! That shipping gets me everytime but i’ll probably break down one day and I want to make sure its worth it.